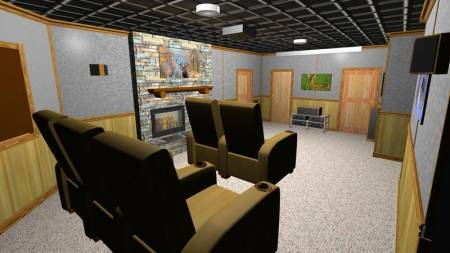 I've been dreaming about turning my basement family room into a home theater. I decided to see what it would look like and how things would fit, so I modeled the whole thing in a program called Carrera. In this fantasy, the front speakers are M60s, the center is a VP160, the surrounds are QS8s, and the sub is an EP500. The projector is a JVC DLA-X35. The screen is a motorized 125" diagonal 16x9. I roughed out some theater chairs, just for a sense of scale. The whole thing is dimensionally accurate. Cool software! Are the two doors behind the screen already in your basement - is that why they're there? How long did it take to make it with the software? Yes the doors are already there. One's a closet and one's to the bathroom. That's why I'm thinking of a motorized (rather than fixed) screen. It took me about a fortnight of evenings, maybe 12 or 14 hours, to put it together. Like real construction, the time gets eaten up doing the stuff like moldings and trim. Also the fireplace took a while. It can all be animated, as well, but the resulting file would be too big to post here. Can either a 2nd door be added to the bathroom, or moved to a different wall? This would eliminate the possible need to stop the movie and raise the screen whenever someone had to use the facilities. Is it also possible to turn everything around 180 degrees and put the screen on the other wall? Probably drop down also. At lease that way the restroom would be readily accessible. Seating wouldn't be near the fireplace, but you probably wouldn't want the fire going while watching a movie anyway. And it'd take the sides of the seating away from the front of the fireplace, that you probably wouldn't want it there anyway, IMO. There is another door into the bathroom through the adjoining bedroom, so that should address that problem. I don't think rotating 180 degrees would work. That end of the room has 45 degree angled walls on each side, and the stairway coming down from upstairs, so there's no where for the speakers and the screen would have to be smaller. J.B. - I'm also worried about having the M60s (especially the one on the right) so close to the wall. It would only have a couple inches of clearance on that side, although it could be out a comfortable distance from the rear wall. Would that be seriously detrimental to the sound, do you think? if you would stick some 1 inch thick sound absorbing/diffusing panel on the sidewalls where primary reflections occur, it would be beneficial. i would also move them away from the front wall; 3 ft or so would be good; if 3 ft is too much, then less is much better than nothing. in the end, calibration and then critical listening will permit you to refine the setup. look for realism in stage and instrumental reproduction, without any parts sounding exaggerated or weak. to do this, it's best to play at Reference Level or, for music, at a realistic level. Silly question, but could you flip flop the room? Put the screen on the current "back wall"? Since the seats are away from the back wall anyway, you could still get around them in order to use the bathroom. Plus this would allow for the speakers to be pulled away from the extreme sides of the room because of the doors. BTW, I was surprised that no one commented on the Canadian bobsled running on screen during the Vancouver Olympics. I put that on there just for all of you Canucks!